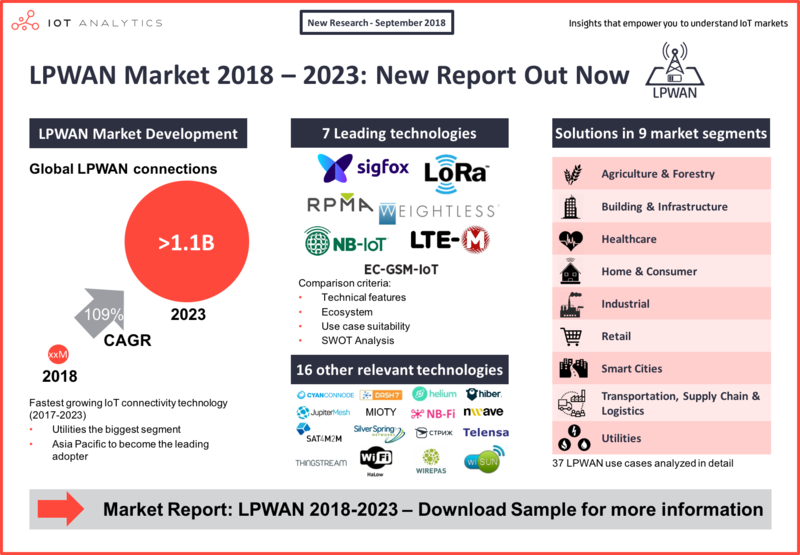 IoT Analytics, a leading provider of market insights & competitive intelligence for the Internet of Things (IoT), M2M, and Industry 4.0, today published a comprehensive 260-page market report titled LPWAN Market Report 2018-2023. 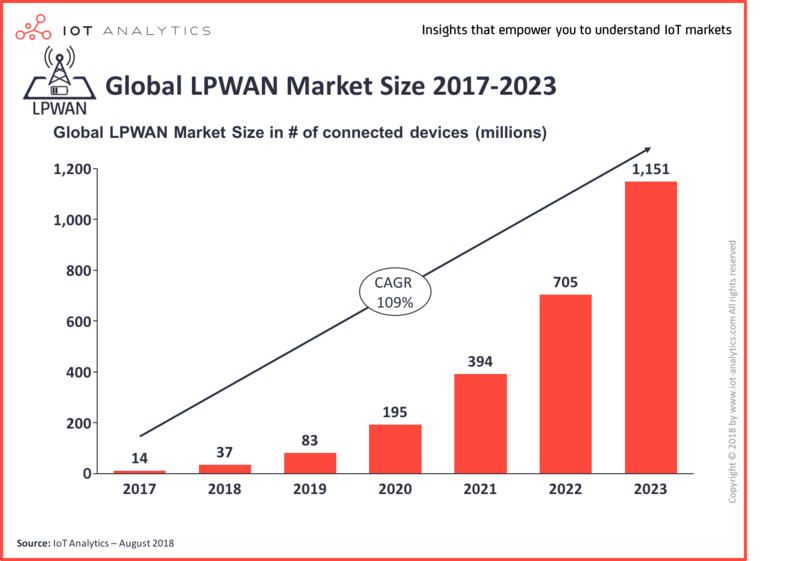 As active global IoT connections grow from 7B in 2018 to 22B in 2025, Low Power Wide Area Networks (LPWAN) are expected to be a key growth driver. These technologies provide low-power, low data-rate communication over long distances or from deep indoor environments, enabling battery-operated devices to operate for up to 10 years without any human intervention. World-wide public network roll-outs and private network deployments of this relatively new technology are currently proceeding quickly. This momentum is driving strong growth in adoption as the number of connected devices is forecasted to grow at 109% per year until 2023, reaching more than one billion active connections. While the market fragmentation remains high, NB-IoT, LoRa and Sigfox are emerging as the most popular LPWAN technologies both in terms of end-user adoption as well as ecosystem support, with the first two forecasted to be the dominant technologies over the forecasted period in public network and private network deployments respectively. The LPWAN report forecasts a compound annual growth rate (CAGR) for LPWAN connections of 109% over the time frame of 2017-2023, with annual spending for connectivity surpassing US$4.7 Billion by 2023. These numbers are based on the analysis of world-wide LPWAN network roll-outs and state of adoption across 9 industry segments(Agriculture & Forestry, Buildings & Infrastructure, Healthcare, Home & Consumer, Industrial, Retail, Smart Cities, Transportation, Supply Chain & Logistics, and Utilities). The market is broken down into 5 technologies (Sigfox, LoRa, NB-IoT, LTE-M, Others), 5 regions (Asia Pacific, Europe, North America, Middle East and Africa, Latin America), 2 spectrum types (Unlicensed and licensed), 2 network deployment types (public networks, private networks), and 2 revenue types (IoT modules and connectivity data plans). In developing the 260-page report, the analyst team at IoT Analytics studied over 25 communication technologies that offer a combination of low-cost, low-power, long-range communication for large numbers of devices, and looked into more than 150 companies either offering network access and/or services or developing products or solutions based on these technologies. Further input to the report included 40+ industry interviews and numerous expert discussions at 10+ leading IoT conferences. 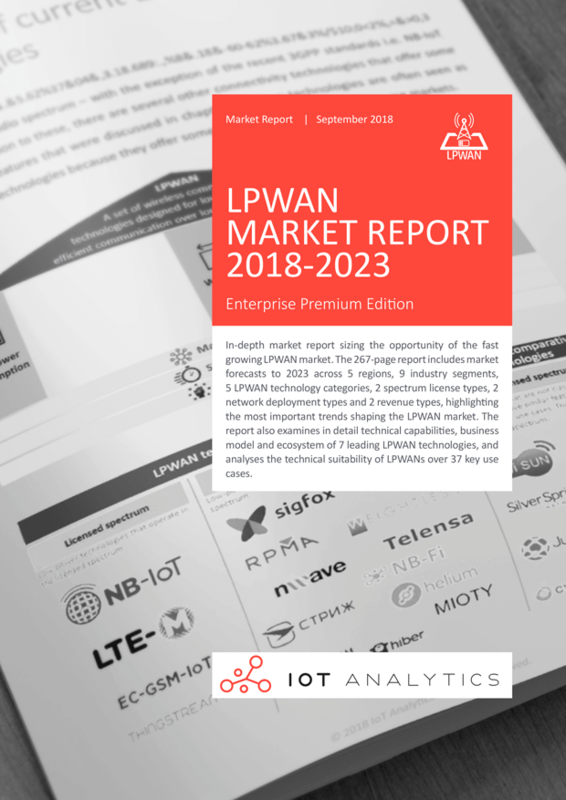 The report analyzes in detail the 7 most important LPWAN technologies today – Sigfox, LoRa, RPMA, Weightless, LTE-M, NB-IoT and EC-GSM – discussing their technical features, ecosystem and business model, and provides a brief overview of 9 other LPWAN technologies (e.g., Thingstream, Telensa, NB-Fi) as well as 7 other technologies that are similar or complementary to LPWAN (e.g., Wi-SUN). 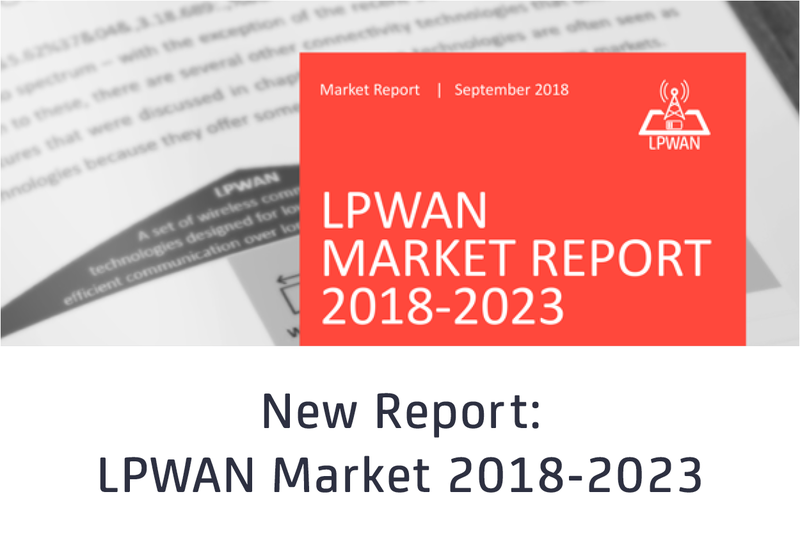 The report also examines 37 key use cases over 9 market segments, discussing their application requirements and analyzing how well each of the major LPWAN technologies are suitable to satisfy these requirements. On top of that, 10 examples of successful deployments of LPWAN Technologies are presented to give a good representation of where the market is at today. “LPWAN are a fascinating technology. 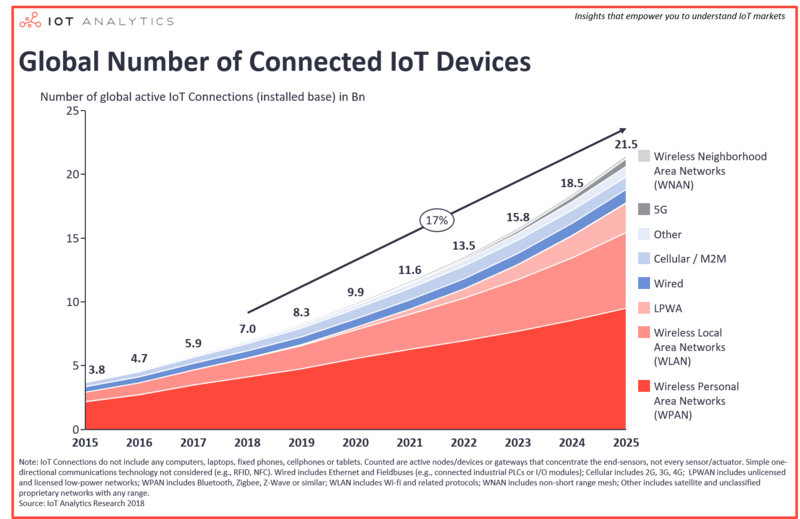 It is enabling new IoT use cases that were previously unimaginable, mainly because devices can transmit data up to 10 years without the need for a new battery. While Sigfox and Lora have proven in the last 5 odd years that this is a viable technology which does bring value to a variety of industries, we have now come to the point where industries are starting their adoption on a much wider scale”. The Market Report is available to download HERE. IoT Analytics is the leading provider of market insights & competitive intelligence for the Internet of Things (IoT), M2M, and Industry 4.0. The specialized data-driven research firm helps more than 40,000 Internet of Things decision-makers understand IoT markets every month. IoT Analytics tracks important data around the IoT ecosystem such as M&A activity, Startup funding, company projects, use cases and latest developments. Product offerings include in-depth market reports, technical whitepapers, sponsored research, regular newsletter, as well as Go2Market and consulting services. As a research pioneer, IoT Analytics combines traditional methods of market research such as interviews and surveys with state-of-the art web-mining tools to generate high-calibre insights. Eugenio is a Principal Analyst with a background in Electrical and Telecommunications Engineering. His research focuses on the future of communications, and he is IoT Analytics’ Lead Expert for IoT Connectivity. Is there any similar report for India LPWAN market? Do you consider myDevices in your report ?